Welcome to Fitness Fridays, a new series that will feature various ways you can combine transit and fitness. The purpose of the posts: too many of us spend too much time indoors, sitting on our butts, staring at one screen or another. We hope this series will inspire you to grab your friends, give transit a try and explore the great outdoors that might be right in your neighborhood. First up: Baldwin Hills Scenic Overlook, also known as the Culver City Stairs. This is a state park that is normally open from 8 a.m. to sunset, although hours currently may vary due to a trail and stormwater improvement project. On the day that I visited recently, the entire trail was open. 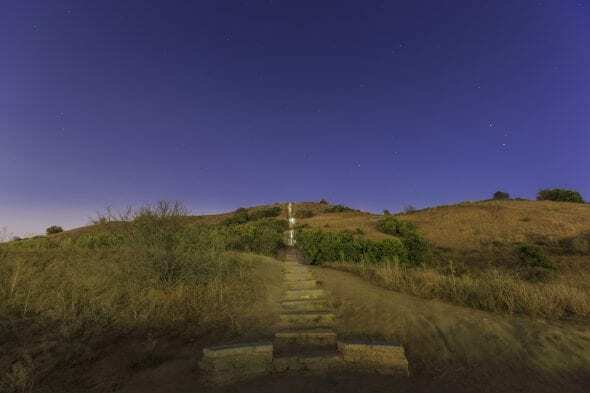 Long stairs at Baldwin Hills Scenic Overlook at night. Photo via Getty Images. To get to Baldwin Hills Scenic Overlook, take the Expo Line to La Cienega/Jefferson Station. From there, it’s about a thirty-minute walk south on Jefferson Boulevard to the trailhead. Consider it a warm up! The walk is flat and it’s sidewalk all the way. You could take a bike or scooter if you’ve got one — that will cut the travel time down to about ten minutes, and there is a bike path on Jefferson. The Ballona Creek Bike Path is also nearby. Just keep in mind that bikes and scooters are not permitted on the trail itself, so you’ll have to park it and lock it once you get there. Bonus tip from Source reader Pat: you can take the Link shuttle to reach the trailhead on weekends and holidays. Fare for the shuttle is $.25 and it connects to the Expo Line at La Cienega/Jefferson Station. Feeling optimistic at the bottom of the hill. Original photo here. Once you arrive at the stairs, start climbing! If you want to work those glutes, take the “stairs.” It’s 282 steps all the way to the top. Don’t be intimidated by some of the extremely fit people running up and down like mountain goats — they won’t judge you if you need a break or two on the way up. (At least, they didn’t judge me as I took multiple breaks to wheeze on the side of the trail.) And there are plenty of regular schmoes trekking as well, just trying to work up a sweat. If the thought of climbing stairs makes you want to sit down and cry, you can try the more roundabout trail. It’s nice and wide and loops up the hill, so the walk will take longer but probably be easier on the knees. The view from the top isn’t amazing, but it’s not bad either. You can easily see the Hollywood sign and the DTLA skyline, even on a smoggy and/or smokey day. Which it practically every day lately 😕. Rain please. If it’s a sunny day when you go, definitely use sunscreen or bring a hat because there’s zero shade along the trail. And of course, make sure you have a bottle of water. Now get out there and challenge yourself! And despite the title of the series, you don’t have to go on a Friday. Pick a day that’s good for you, I won’t mind. I met Supervisor Mark Ridley-Thomas when I visited here with my parents, almost a decade ago. It’s a great spot! Hey, thanks – I always forget about this place, so I’ll have to put it on my weekend to-do list. Wear sunscreen even if it’s not sunny. Clouds don’t block UV light, so you can still get a sunburn. Thanks for the link! I totally forgot about that shuttle and will add it to the post!